Days before the opening of the G20 Summit in St. Petersburg, its host, Russian President Vladimir Putin, disclosed some information about the planned agreements. 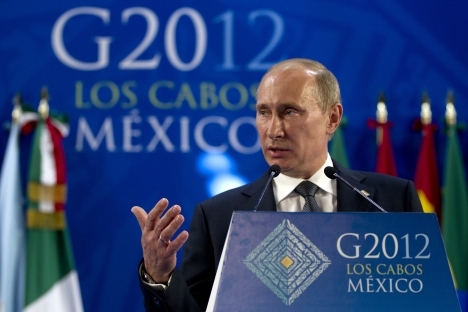 When ascending to the G20 chairmanship back in December 2012, Russia announced its main goal as the “concentration of G20 efforts on developing measures to stimulate economic growth and creation of new jobs.” The ways to achieve these goals are primarily through the encouragement of investments, effective regulation, increased trust and market transparency. In light of these priorities, the St. Petersburg Summit will focus on discussing such issues as the state of the global economy, promoting employment, reforming the world’s currency system and the financial regulation and supervision system, stability of global energy markets, strengthening of multilateral trade, and combating protectionism and corruption. Russia will propose two new topics for discussion: funding of investments as the basis for economic growth and creating more jobs, as well as the modernization of national state borrowing systems and management of sovereign debt. “We have worked most responsibly on every point on the declared agenda, and are coming to this summit with a large set of agreements,” reads Putin’s speech for the summit. Among the most important agreements, he mentioned coordinated measures in combating tax evasion. In the President’s words, the plan developed by G20 with support from OECD is the biggest step in the improvement and coordination of tax policies undertaken in the last hundred years. Suffice it to say, that in advance of this decision, most offshore zones have already spoken about reducing bank secrecy. Among other innovations introduced by Russia as the chair of the summit, there is a joint meeting of ministers of finance and ministers of labor from G20 member states. This is the first time that public officials from different countries will work together. This new approach has already paid off, as it has helped connect macroeconomic and financial policy issues with the tasks of social protection and creation of more jobs, as well as enabling discussion of measures to promote the employment of youth and vulnerable categories of people. “An important role in improving transparency and efficiency of our work is played by the intensive dialogue between the Russian chairmanship and all interested parties: countries which are not G20 member states, regional alliances and international organizations, business, trade unions, civil society, youth and expert centres. We took every effort to take into consideration all interesting and useful recommendations and suggestions from our outreach partners,” stresses Putin’s speech. Speaking about Russia’s achievements, the president noted the report on the meeting of objectives in promoting development that G20 had previously undertaken. This is a large document, which is to become the foundation for a new plan – and will become known as the St. Petersburg Development Strategy. This strategy was presented to the media on August 28 by the Russian representatives at the G20, Ksenia Yudaeva, chief of the expert department in the administration of the Russian President and Sergey Storchak, Deputy Minister of Finance. They emphasized that this is the first report of this kind in the five-year history of G20 summits. The document analyzes the performance of the 2010 Seoul Summit decisions. According to Yudaeva, 33 of the 67 undertaken objectives have been achieved, while work on another 33 objectives continues. The performance of one objective has been suspended – this is the development of a power-generating and transportation infrastructure. Storchak said the G20 countries spend up to $100 billion annually to support developing economies. To this amount, Russia contributes about $500 million. To a question from RIR, concerning which regions Russia will favour in its aid programs, Andrey Bokarev, chief of the international financial organizations department at the Ministry of Finance of the Russian Federation, said the largest amount of funding is directed to Eastern Europe and Central Asia. Other recipients of large aid portions include South-East Asia, the Middle East, and African territories south of the Sahara Desert. In addition, the summit will approve a draft action plan for the G20 Summit in 2014, when Australia will take over the chairmanship. Next year, Russia will chair the G8 Summit. No doubt, this will be a unique opportunity for our country to introduce its priorities, amendments and recommendations onto the global agenda.